Sweet Cheeks Adventures: FREE Mug from Tinyprints! This post contains affiliate links. I may receive compensation upon clicks of links. Click HERE for your FREE Mug! 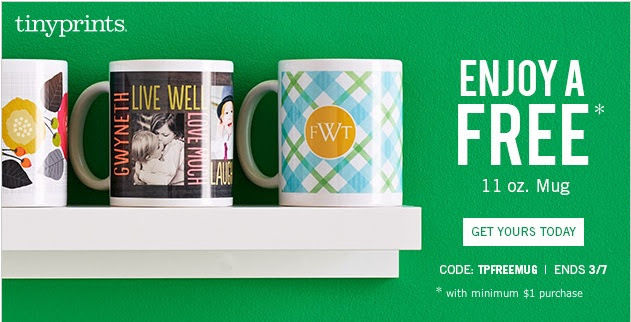 Use code TPFREEMUG at checkout to enjoy one (1) free mug!! There is a $1 minimum purchase required for this promotion. This offer is not applicable to previously placed orders or toward the purchase of calendars, photo books, gift certificates, personalized postage stamps and Erin Condren weekly planners. Valid only for new Tiny Prints customers (those who have never purchased from Tiny Prints). Offer cannot be redeemed more than once per account, household and/or billing address. This particular offer code can only be redeemed once. Offer is only valid on Tiny Prints and is not applicable to third party or partner websites. To prevent fraud or abuse, we reserve the right to discontinue or modify this offer or cancel any order. Offer ends 3/5 11:59 PM PST.